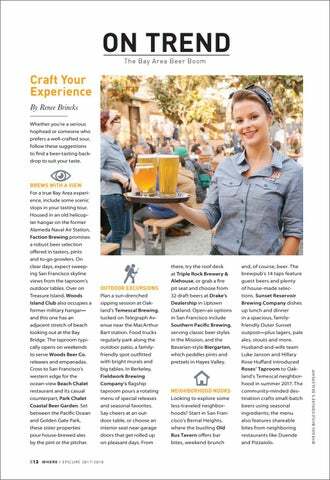 Craft Your Experience By Renee Brincks Whether you’re a serious hophead or someone who prefers a well-crafted sour, follow these suggestions to find a beer-tasting backdrop to suit your taste. there, try the roof deck at Triple Rock Brewery & Alehouse, or grab a fire pit seat and choose from 32 draft beers at Drake’s Dealership in Uptown Oakland. Open-air options in San Francisco include Southern Pacific Brewing, serving classic beer styles in the Mission, and the Bavarian-style Biergarten, which peddles pints and pretzels in Hayes Valley. and, of course, beer. The brewpub’s 14 taps feature guest beers and plenty of house-made selections. Sunset Reservoir Brewing Company dishes up lunch and dinner in a spacious, familyfriendly Outer Sunset outpost—plus lagers, pale ales, stouts and more. Husband-and-wife team Luke Janson and Hillary Rose Huffard introduced Roses’ Taproom to Oakland’s Temescal neighborhood in summer 2017. The community-minded destination crafts small-batch beers using seasonal ingredients; the menu also features shareable bites from neighboring restaurants like Duende and Pizzaiolo. BREWS WITH A VIEW For a true Bay Area experience, include some scenic stops in your tasting tour. Housed in an old helicopter hangar on the former Alameda Naval Air Station, Faction Brewing promises a robust beer selection offered in tasters, pints and to-go growlers. On clear days, expect sweeping San Francisco skyline views from the taproom’s outdoor tables. Over on Treasure Island, Woods Island Club also occupies a former military hangar— and this one has an adjacent stretch of beach looking out at the Bay Bridge. The taproom typically opens on weekends to serve Woods Beer Co. releases and empanadas. Cross to San Francisco’s western edge for the ocean-view Beach Chalet restaurant and its casual counterpart, Park Chalet Coastal Beer Garden. Set between the Pacific Ocean and Golden Gate Park, these sister properties pour house-brewed ales by the pint or the pitcher.